You have been assigned to manage a team or project at work, but things don’t seem to be going well. The employees could be at fault, that’s always a possibility. But, self-reflection is a humbling process that can surprise us with its outcome. So, before you start lashing out on your team take a moment to reflect the following ways in which you might be crushing your team’s motivation and performance. If you hire the right person, that person won’t need to be micromanaged. That doesn’t mean you shouldn’t receive updates about a project, or that you won’t help if needed. Instead, it means that your employees will have the necessary space to be the competent personnel you hired. If the employees start feeling asphyxiated their confidence will lower, and they will stop being proactive and self-starters. Why? Because they know that at any moment you will tell them that what they did was not good enough, or that you would have done it differently. Joe Apfelbaum said, “Micromanage the process, not the people.” and that’s how it works best in most industries. It is not easy, but when hiring is done right, you should be able to feel confident enough to delegate work and empower your team. People like to be listened to, and your team is no different. If you dismiss their ideas without explaining why they won’t work, your employees won’t care about anything else than finishing their task and going home. In theory, this doesn’t sound bad. Still, you don’t want to discourage your employees from sharing ideas that can improve a process. Some of the best ideas I have come across came from people from different departments or new employees that were looking at an issue with fresh eyes. Now that we are on the topic of ideas, never take credit from an idea that’s not yours, notably if you dismissed it at first. Doing so will only boost your ego for a while, and then it will start destroying your professional reputation. If you’re not flexible with your team, they’ll eventually leave. It might take a few days, weeks, or maybe even years, but they’ll be gone when you least expect it. The 2018 Global Talent Trends study by Mercer found out that if thousands of employees in different industries agreed on something, it was on the desire for workplace flexibility. After hundreds of companies invested money in ping pong tables, open office plans, healthy snacks, and event tickets, most employees would trade any of these benefits for a few more hours of PTO and the ability to choose their work schedule (at least on some days). A benefit that would come at a lower cost for the company and that would make the employees happier. If I have seen something destroy the spirit of a team is when favoritism becomes obvious. To avoid this, make sure to have the necessary policies and procedures in place to guide your team responsibilities. When something is on paper, there is less bias coming from your part, and the only justification for a decision you have to give is the policy itself. Also, take some time to know your team and what each of them does best and how. You can have two people working in the same position, but they might work in entirely different ways. For example, I have seen employees that thrive working alone, and others that perform better in a social environment. Information like that might even help when designating workspaces and assigning tasks. Some people would argue that recognition on the job is not essential because they are being paid and what they are doing is what they were hired to do. Nonetheless, as humans, we enjoy feeling appreciated. Positive feedback when a task is completed on time, or even a bonus when the employee goes the extra mile, can do wonders for employee productivity. Something as simple as a handwritten thank you note can make someone’s day, and make them feel happy about working with you. 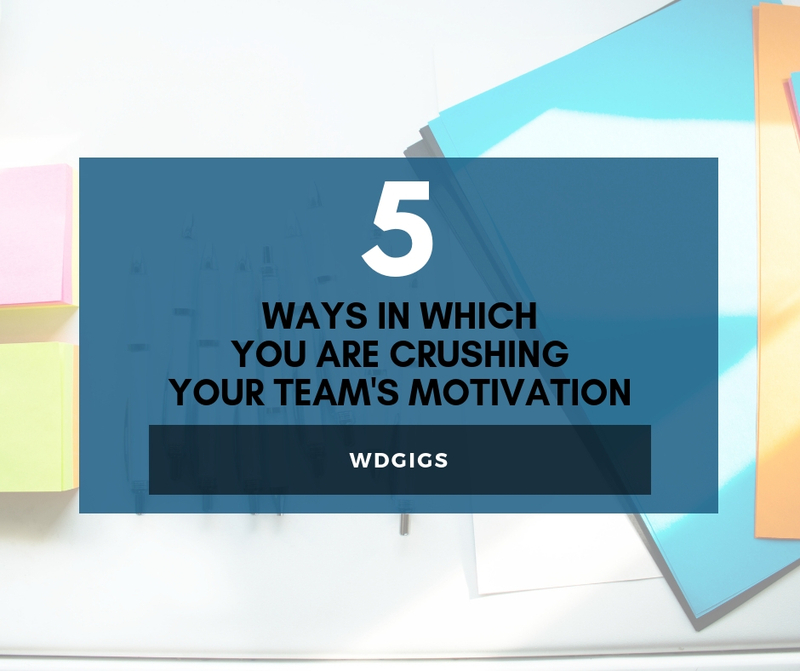 Share with us in which other ways a team’s motivation can be crushed.